This Biography was prepared for us by Dale Robinson. This biography is on the man who will be always remembered for his memorable role of moonshiner, Jubal Foster in episode # 45, " Keeper Of The Flame." 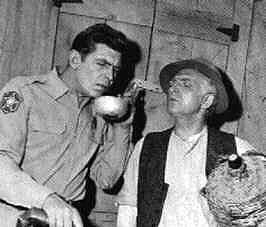 Everett Sloane's other contribution to The Andy Griffith Show is not as well known to fans of the show. He wrote the seldom heard lyrics to the theme song of the show, " The Fishin' Hole." This version can be heard with Andy Griffith proudly singing on the 1961 Capitol records LP, " Songs, Themes And Laughs From The Andy Griffith Show, " as well as numerous compiliation records of Andy Griffith's singing and comedy that have been issued in the past few years. Everett Sloane was born on October 1, 1909, in New York City. He passed away in 1965. He was educated at the University Of Pennsylvania and in the 1920's, he was a runner on Wall Street. When the great stock market crash hit in 1929, he turned to acting on stage as well as hundreds of radio dramas. He made his Broadway debut in 1935, and shortly thereafter, became a member of Orson Welles's legendary Mercury Players Theater. Voyage To The Bottom Of The Sea Wagon Train The Zane Grey Theater and Zorro. 1964 - The Disorderly Orderly and The Patsy.